The special pricing discount applies to the anesthesia, teeth and gingiva cleaning, necessary oral care/treatment, polishing and fluoride treatment. We will also perform a FREE comprehensive examination, nail trim, and ear cleaning for each pet. Oral/dental disease is among the leading causes of pain and discomfort in our cats and dogs of all ages. At the Animal Medical Center we want to make sure that your pet is as healthy as it can be. This includes their teeth and gums! Our goals are to identify, correct and prevent problems in the mouth as well as provide a pain-free life for your pet. During the procedure your pet’s teeth and surrounding tissues will be carefully evaluated for signs of disease and/or dysfunction. Any concerns we find will be cared for. Plaque/tartar removal and polishing of your pet’s teeth will also be performed to help treat halitosis (bad breath) and to identify if there are any cavities or fractures in the teeth. Each tooth is a living organ and can cause pain if injured. In order for your pet to be comfortable it is our job to treat these sources of pain. Our team will also set a future plan for your pet’s dentistry needs based on the findings of the dental cleaning and exam. Some pets need cleanings more frequently than others. An ounce of prevention is worth a pound of cure! Let us be your Pet Advocates helping you on the road to a happy, healthy life with your pet. Spaces are limited so don’t delay. 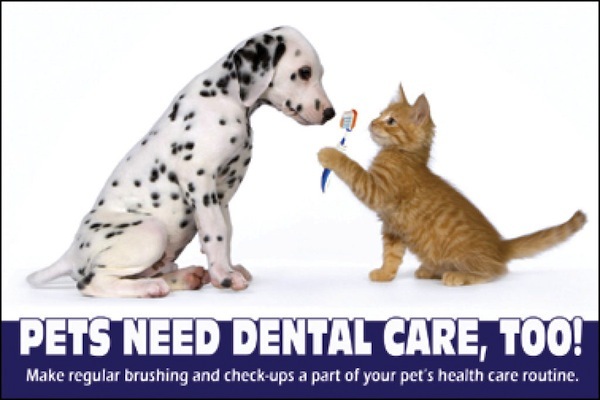 Please “click” the “REQUEST AN APPOINTMENT” or call 231-943-8500 to schedule your pet’s dental today!